A unique opportunity to see the latest in industrial automation, up close. 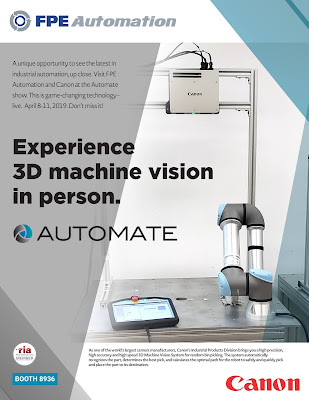 Catch FPE Automation and Canon at the Automate show April 8-11. The latest in parts recognition will be on display. FPE's experts are putting together a Universal Robots table with the Canon system mounted, and a demo to illustrate 3D bin picking live and in person! Don't miss it. We'll be at booth 8936.